National-level implementation of the 2030 Agenda for Sustainable Development and the Paris Agreement on climate change proceed on different tracks, despite growing recognition of the ample opportunities they present for synergies. In most countries, climate actions under the Nationally Determined Contributions (NDCs) and national targets underpinning the global Sustainable Development Goals (SDGs) have been defined and advanced separately. This siloed approach makes little sense given the short window of opportunity for tackling the interlinked challenges of climate change, ecosystem degradation, inequality rise, and political instability. High-level political forums in 2018 and 2019 and the Talanoa Dialogue, reviewing implementation of the SDGs and NDCs respectively, offer near-term opportunities for countries to foster this discussion and build on greater synergies to ramp up their national ambitions. National-level implementation of the 2030 Agenda for Sustainable Development and the Paris Agreement on climate change generally proceed on different tracks, despite growing recognition of the ample opportunities they present for synergies. In most countries, climate actions under the Nationally Determined Contributions (NDCs) and national targets underpinning the global Sustainable Development Goals (SDGs) have been defined and advanced separately. This siloed approach makes little sense given the short window of opportunity for tackling the interlinked challenges of climate change, ecosystem degradation, inequality rise, and political instability. Drawing on experience in 11 countries and the European Union, this paper provides core elements and concrete examples for jointly advancing these agendas, with a focus on five challenges: coordinating institutions, aligning national climate and SDG-relevant targets, mainstreaming both set of goals into policy planning, optimizing financial resources, and building mutually reinforcing monitoring and reporting frameworks. The research also explores how international development can better support national efforts at linking both agendas. Countries can share experiences in advancing both agendas jointly through global review and reporting processes under the Paris Agreement and the 2030 agenda. High-level political forums in 2018 and 2019 and the Talanoa Dialogue, reviewing implementation of the SDGs and NDCs respectively, offer near-term opportunities for countries to foster this discussion and build on greater synergies to ramp up their national ambitions. Following the adoption of the 2030 Agenda and the Paris Agreement in 2015, countries now face the challenge of advancing two very ambitious sets of goals to achieve climate-resilient, sustainable development by 2030 and carbon neutrality by the second half of the century. Although climate action and sustainable development have long been addressed separately in policy and research discussions, the two agendas provide a strong basis for integration. The SDGs mainstream climate change across their targets and emphasize the role of the United Nations Framework Convention on Climate Change (UNFCCC) for defining climate ambition. The Paris Agreement mandates that countries carry out climate actions in the context of sustainable development and poverty eradication. However, despite growing recognition of these linkages, the two agendas are generally advanced in separate tracks. In most countries, national coordination frameworks for the SDGs and climate action are led by distinct institutions and engage stakeholders through different arrangements. Based on a survey of 90 countries conducted by WRI, this paper highlights that, on average, seven out of eight countries chose environment ministries to steer NDC implementation while they entrusted the 2030 Agenda to more central cabinet-level institutions, such as offices of the president or prime minister or planning and finance ministries. Policymakers from across survey countries report significant challenges in connecting the two processes because each has its own history, community of actors, and political dynamics. As a result, national SDG-relevant targets and climate actions are often defined with limited coordination between relevant agencies. Efforts at embedding the two sets of goals in development plans also lack an integrated approach, and the proliferation of different guidance for SDG, NDC, gender equality, and green growth mainstreaming overload planning processes. Given the short time frame for meeting the ambitious SDGs and Paris goals, it is imperative that countries shift to a more joined-up approach to implementation. This paper seeks to support governments as they embark on this process by drawing on early experience by first mover countries. Our findings are based on in-country visits and interviews with stakeholders, including representatives of relevant government institutions, civil society groups, research institutes, businesses, and international organizations. The 11 countries plus the European Union (regional-level policies)also reflect an income and geographic balance and include Bangladesh, Colombia, Ethiopia, Finland, France, Indonesia, Kenya, Mexico, Peru, the Philippines, and Uganda. All but Finland are members of the NDC Partnership, a global coalition for advancing the NDC in synergy with the SDGs, which is supported by the German Government and hosted by WRI and the UNFCCC. In addition, the authors conducted a survey of 90 countries to identify common lead institutions for implementing both the 2030 Agenda and the Paris Agreement. The clear overarching message from this research is that advancing the two agendas in a consistent and integrated way requires linking up institutional, policy, financial, and monitoring instruments and frameworks that support their implementation. Examples of national policy options and practices that are most relevant and replicable are also included throughout the paper. Joining up SDG and NDC implementation often starts with consistent leadership. To overcome siloed processes, there is a clear need for regular coordination and joint initiatives among the different ministries and directorates that generally lead government efforts on the 2030 Agenda and climate change. Distinct lead agencies for the SDGs and NDCs can collaborate effectively through clear arrangements, including participation in national coordination bodies for both agendas, regular check-ins to foster synergy between implementation strategies and work plans, and common policy planning instruments to mainstream both sets of policy objectives jointly in planning and budgeting. However, the research suggests that in the rare cases where one agency leads on both agendas, this outcome does not necessarily enhance policy integration. This is because environment ministries commonly undertake this role and may lack the leverage to achieve inter-ministerial coordination. A coherent whole-of-government approach to both agendas ****requires efficient institutional solutions. 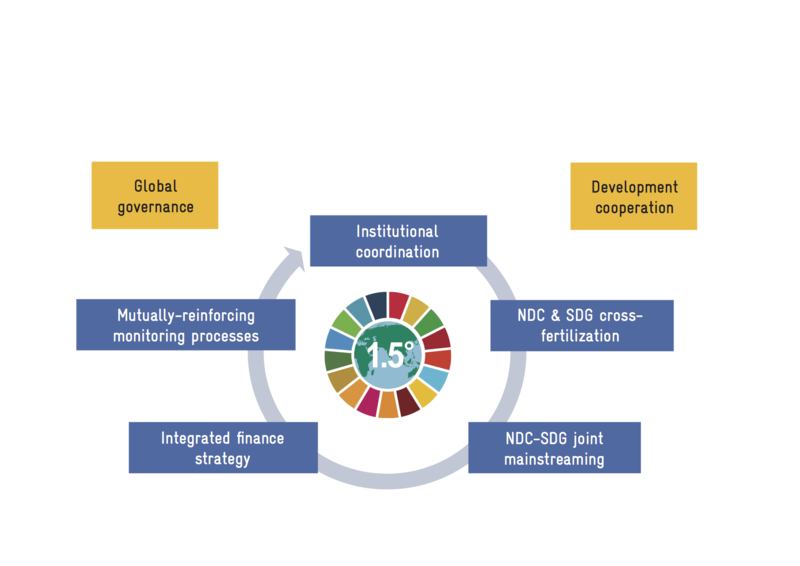 Rather than introducing entirely new coordination mechanisms, SDG and NDC implementation frameworks can be linked through institutional shifts that provide greater efficiency. Examples include assigning coherent joint responsibilities to ministries and agencies for advancing both the SDGs and the national NDC, requiring high-level participation in national coordination bodies for both agendas in order to foster consistent decision-making, and mandating that there be SDG and climate-change focal points across ministries to collaborate on mainstreaming SDGs and NDCs in policymaking and to facilitate efficient data collection. Including parliaments and local authorities in both SDG and NDC national coordination frameworks is also key to promote integrated planning. Climate and development communities of actors need to be brought together. Participation by climate experts in national coordination bodies for the 2030 Agenda and SDGs and participation by development experts and vulnerable communities in climate coordination bodies can facilitate greater coordination and integration. Both agendas can also be addressed simultaneously through multistakeholder engagement frameworks, such as multidisciplinary advisory expert groups and national forums gathering various interest groups. Cross-fertilization between national climate action and SDG-relevant targets is a condition to pursue the two agendas in an integrated and efficient way. Screening climate actions to ensure alignment with the SDGs and the overriding objective of “leaving no one behind” (LNB) helps define and prioritize policies that achieve synergies and benefit to the poorest, most vulnerable and marginalized groups. Similarly, climate actions and priorities under the NDCs can help translate global SDGs into nationally relevant targets. Several countries have also prioritized national climate commitments that are lagging behind in NDC implementation in their national SDG strategy. Greater alignment sheds light on options for greater ambition. Some countries have defined or strengthened climate action underpinning their NDCs based on the ambition of SDGs targets and potential co-benefits for achieving the SDGs. Similarly, alignment with the NDC and the Paris Agreement can lead countries to enhance the ambition of their national SDG-relevant targets. Designing single long-term carbon neutral, sustainable development strategies would make a lot of sense to drive more effective and ambitious transitions. Countries that will develop their long-term low-carbon strategies in the coming years should consider broadening their scope beyond a focus on decarbonization, and involving a much broader range of stakeholders beyond climate experts, to carve out an overall national development trajectory that meets both agendas. Integrated long-term strategies could sequence actions and milestones in a way that maximizes benefits for both agendas and avoids lock-in effects in the short and long runs. Achieving alignment and synergies with the SDG targets would also help countries plan for supporting inequality reduction, despite the impact of climate change, and ensuring a just transition of the workforce—a challenge that remains seldom mentioned in climate plans. Aligning national SDG targets and climate commitments is a step forward, but a fully joined-up implementation would bring the two agendas jointly into national and local policy planning to reduce transactions costs and foster win-win solutions. Such efforts start with comprehensive gap analysis against both agendas. A few countries have undertaken policy reviews to identify main gaps and inconsistencies against both agendas. Guidelines for joint SDG-climate mainstreaming can promote integrated planning. Line ministries often tend to cherry-pick SDG and climate targets, sometimes to match sectoral targets that they have already identified. Therefore, a key indicator for policy coherence for both agendas is not the number of targets addressed, but the definition of actions generating multiple benefits for both agendas through cross-sectoral, integrated planning approaches. Guidelines for joint SDG-climate mainstreaming can promote such approaches and spur policy planners address policy linkages. The central involvement of SDG and NDC lead institutions in key planning processes helps foster policy alignment. Several countries have started to build both sets of goals into the country’s long-term vision and multi-year development plans that are the basis for all sector and local-level planning processes. Strong oversight from NDC and SDG lead agencies early on in those processes helps embed both agendas in the core macroeconomic and general framework of draft development plans that is used as common reference by sector ministries to develop their contributions. SDG-NDC mainstreaming needs to be monitored. Early country’s experience suggests that reviews of sector and local plans against both sets of goals can limit the risks of policymakers cherry-picking climate and SDG-related targets and achieving only partial alignment. Efficient solutions to mobilizing and tracking SDG-related and climate finance help optimize resources. Options include issuing instructions for budget preparation to ministries addressing SDGs and climate action and establishing consistent budget coding systems for the two agendas. Finance ministries can also set expenditure increase targets for priorities that deliver great benefits for both agendas. A growing number of national funds and banks have also started to adopt comprehensive investment criteria to leverage climate-smart and sustainable finance. Budgeting processes are powerful incentives for policy integration. In a few countries, line ministries are requested, during annual budget processes, to report back to parliament on progress made on assigned SDG and NDC targets and to justify alignment of future policies and budgets with both agendas. Integrated fiscal and regulatory reforms can help scale up finance for both agendas. Domestic tax and fiscal reform can drive effective incentives to shift public and private finance toward carbon-neutral and inclusive sustainable development. Examples include combination of carbon pricing with allowances mitigating its effects on low-income households, and as trialed in Indonesia, the phase-out of fossil fuel subsidies combined withmeasures to support vulnerable groups. Consistent sets of SDG, climate, and other development indicators and common strategies for tracking data support integrated monitoring of outcomes. Case-study countries employ various approaches to better integrate their SDG and climate indicators. These include incorporating climate dimensions in SDG indicators, using climate indicators for SDG monitoring, defining new hinge indicators relevant to both agendas, setting indicators to track SDG-NDC synergies and trade-offs, and aligning national development indicators with integrated SDG-NDC indicators. Integrated approaches to harnessing the data revolution and improving monitoring systems for both agendas also have great potential for optimizing collection and efficient use of data. National progress reports can address SDG-climate linkages more systematically. A growing number of Voluntary National Reviews (VNRs) at the HLPF address climate action although these efforts to incorporate climate could be pursued more consistently. Similarly, countries can use reporting required under the Paris Agreement and in the UNFCCC process to highlight linkages with SDGs. Greater synergies between and across global- and national-level SDG and NDC reporting processes would also support national efforts to advance both agendas jointly. Alignment and coordination of donor activities involving the two agendas is in the early stages but urgently needed. A growing number of donors have committed to align their strategies and portfolios with the SDGs and the Paris Agreement and have adopted procedures to do so. Some have also proposed capacity building relevant for both agendas in areas such as policy design, statistics and data, and financing. Platforms like the NDC Partnership foster coordinated engagement for effectively and efficiently supporting joined-up SDG and NDC implementation. Collaboration among SDG and NDC lead institutions helps mobilize government and society more effectively. Through coordination, these institutions can overcome potential lack of capacities or authority to bring a wider range of actors together around the two agendas. This, in turn, can transform the challenge of fragmented leadership into an opportunity for greater action and policy coherence. Consistent whole-of-government and -society approaches can reduce transaction costs and help actors adopt integrated planning. Overarching strategies to engage ministries and agencies, as well as climate and development non-state actors, on both agendas avoids duplication in coordination processes. It can also foster creative discussion on climate-sustainable development policy linkages. Aligning national targets to meet the SDGs and NDC commitments help foster synergies and mutual benefits. Through this integrated approach, countries can carve a long-term trajectory that serves both agendas. Designing climate actions through the lens of the SDGs and the objective of “leaving no one behind” offers great potential for strengthening resilience building, pursuing a just low-carbon transition, and reducing poverty and inequality. Linking both agendas also helps improve their ownership. While the NDCs can be regarded as evidence-based, robust targets by climate experts, they are still largely perceived as highly technical documents by sector ministries. The SDGs building on the MDGs are more easily associated with sustainable development gains but may be seen as a far-reaching, unspecific agenda. In the countries studied, greater linkages between both agendas have helped highlight benefits that various stakeholders could draw from these agendas and garner greater buy-in for implementation. In many study countries, policymakers view the SDGs as a strong lever to mainstream climate change into planning. Linking the NDC to the SDGs has helped sector ministries better understand the sustainable development benefits they can draw from climate actions and develop greater ownership of the climate agenda. The 2030 Agenda is presented in some countries as a key framework for planning into which is anchored NDC implementation. Mainstreaming SDGs and NDCs jointly in government planning and budgeting is more efficient and effective. With guidelines for advancing both agendas proliferating, interviewees reported that using criteria to embed climate and development action jointly into development plans, projects, and budgets makes the task of policymakers and project implementers significantly easier. It also encourages these players to design win-win solutions, optimizing financial resources. Mutually reinforcing monitoring and reporting systems are cost effective and will better inform policy planning. Integrating climate and SDG indicators where relevant helps reduce the transaction costs of data collection and enables government agencies to better capture policy linkages. Looking ahead, fruitful interactions among NDC reviews, VNRs, and national planning cycles would enable countries to build on progress achieved under both agendas and increase their ambition.